Visits: 20876 persons viewed this recipe. Kerala fish fry is quite spicy, like most Kerala non-vegetarian dishes. For an average malayalee, a lunch is not complete without a fish fry or curry. It plays a major role in Kerala cuisine. Fish is a protein food with fewer calories than other meat dishes and it fits perfectly into a healthy diet. Try this recipe and post your comments. Whole steaks or cut the fish into equal size pieces. Clean and drain it well. Grind ginger, garlic, pepper, chilli powder, turmeric powder, mustard seeds, curry leaves, lemon juice and salt into a paste. Marinate fish pieces with the ground paste and keep it aside for at-least 30 minutes. Kerala fish fry is ready for serving. Serve it hot with onion rings and lemon wedges. 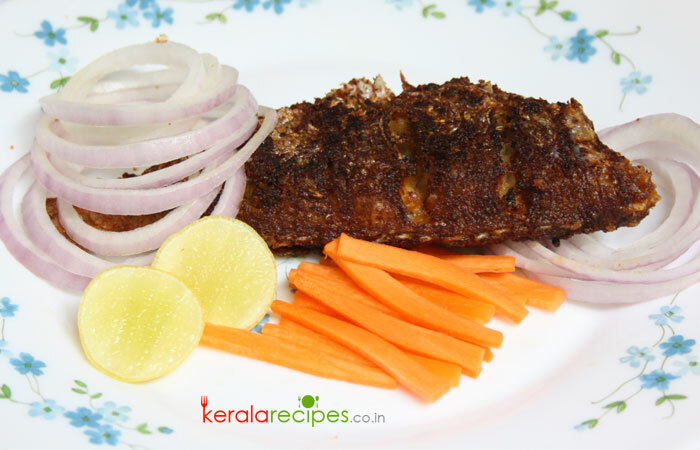 1) Any fish of your choice can be used to make this easy kerala fish fry. 2) If the fish pieces are large, make shallow cut marks on it with a sharp knife, so that the marinade is absorbed easily. In the ingredients you have mentioned about mustard seeds. However, please let me know when and where this mustard seeds to be used. I am leaning through your recipes. I am very raw hand in cooking. Thanks a lot for your recipes. You are welcome Unni. Happy to know that you are learning cooking though my recipes. In fish fry we are grinding mustard seeds along with the other ingredients. (I am sorry, I forgot to mention it in the step 2 and now it is included). Regarding the use of mustard seeds, most of the Kerala side dishes uses mustard seeds. They add a distinct taste to dish. The dishes which we won’t use mustard seeds are avial, olan and thorans with grated coconut etc. Thank you very much for the feedback and also hope to see you here often. It was very tasty and my husband loved a lot. Thank you. You are welcome Merlin. Great to know that this recipe came out well for you and your husband loved it very much. Hope to see you here often. Dear brother, there is one mistake in the ingredients. chilli powder[manjalpodi]. Please check it. Thank you for your good recipes. Dear Sheena, Sorry for the mistake. It is rectified. Thank you very much. I love your site. Thank you. I want to make this as shown in the photo using a whole fish. I would score the fish and marinate as you suggest. How would you cook it? Would you fry on one side and finish it in the oven? Or? Vicki, Thanks for the feedback. No need of oven for this preparation. Just shallow fry the marinated fish by turning both sides.